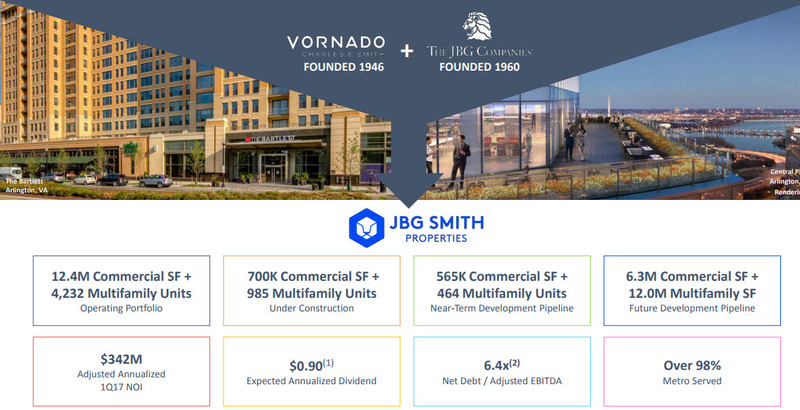 JBG Smith is a $4.8 Billion spin-off of Vornado Realty Trust Washington, DC properties that merged with JBG Companies assets. It has a rich portfolio of offices, residential and commercial buildings with more than $5 Billion NAV of future projects. The Stock is currently fairly valued, but any intelligent investor should add it to their watchlist and buy if it drops below $30. This month, there was only one spin-off in the US (and it is surprising, after a long period of 3-5 spinoffs a month) – JBG Smith Properties (JBGS), one of the best companies I’ve encountered in recent years. 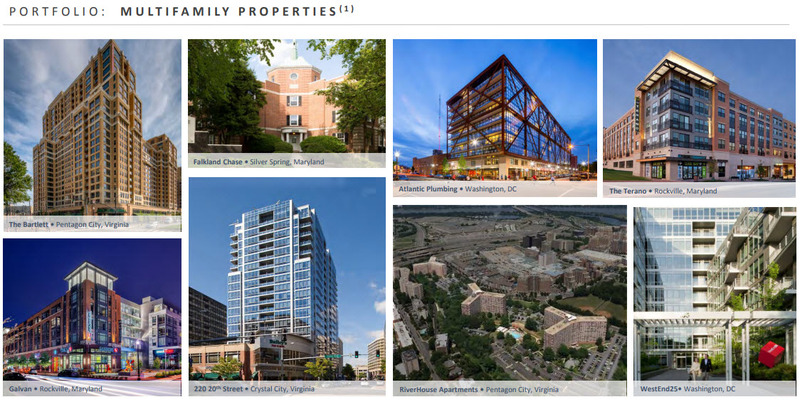 Based in Washington, DC, and was founded by a merger between JBG Companies and a spin-off of Vornado Realty Trust Washington, DC properties. The company has a rich asset portfolio and growth potential in the coming years, but unfortunately, the stock is traded around its fair price so we will have to add it to our watch list and wait for a better entry point. Real estate giant Vornado Realty Trust (VNO) has long ago decided to concentrate only on its real estate activities in New York. Having already separated assets in the past, recently it has also spun out its real estate operations in Washington, DC, and merged it with the real estate business of JBG Companies. 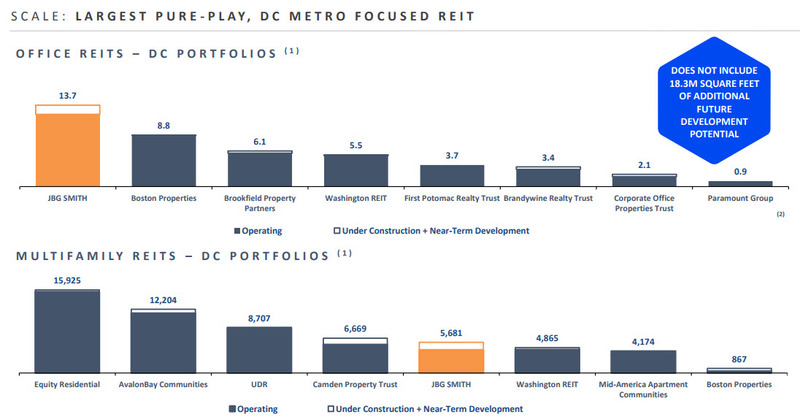 This merge created JBG Smith Properties (JBGS), which became the largest and oldest public REIT operating in the Washington DC real estate market. 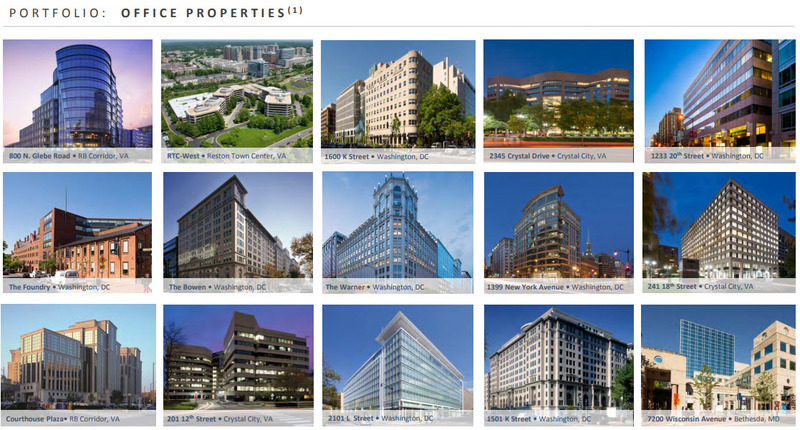 The DC market is one of the strongest and most stable real estate markets in the US, which hosts both American and international companies and, of course, the US government and the various security agencies. 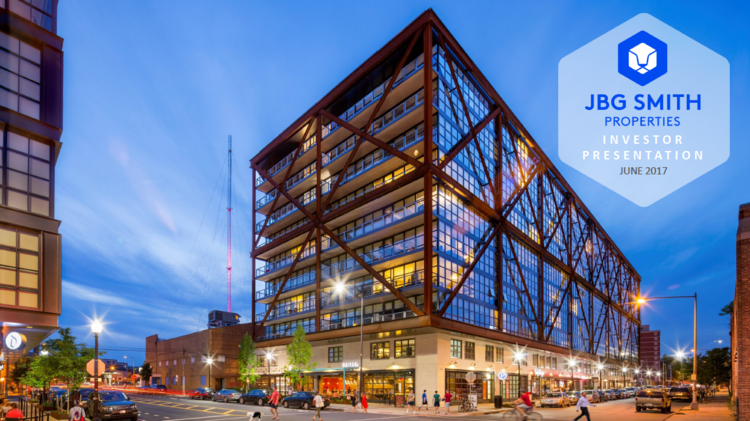 The new JBG Smith will manage 68 properties consisting of 50 office buildings (12.1 million square feet), 14 residential buildings with 4,232 apartments, and another 4 properties used for commercial purposes. The vast majority of the offices are close to large employment centers (such as Crystal City and the Pentagon, District of Columbia, etc.) 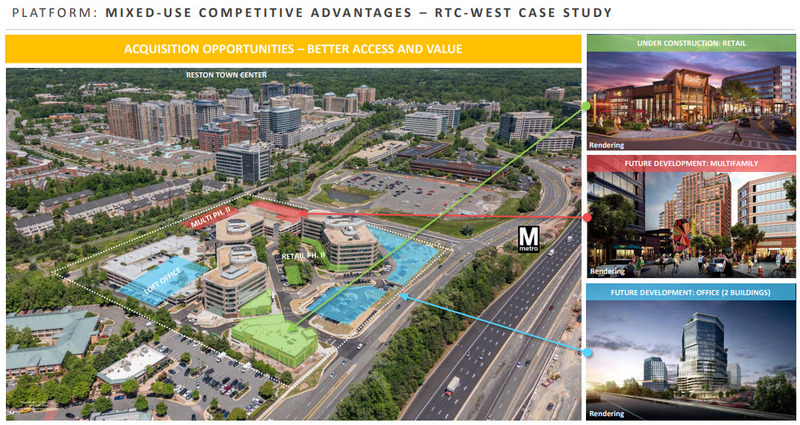 and metro stations, and the residential buildings are located in downtown Washington, making it easier for the company to populate them. other than this, the company has accumulated significant additional assets in different stages of development and construction. Of these, eight office buildings (985 offices) and five residential buildings (464 units) are expected to be completed and populated in the next few years, and the Company has additionally holds 44 lands or assets for future potential developments, in which it plans to build offices or other residential buildings. 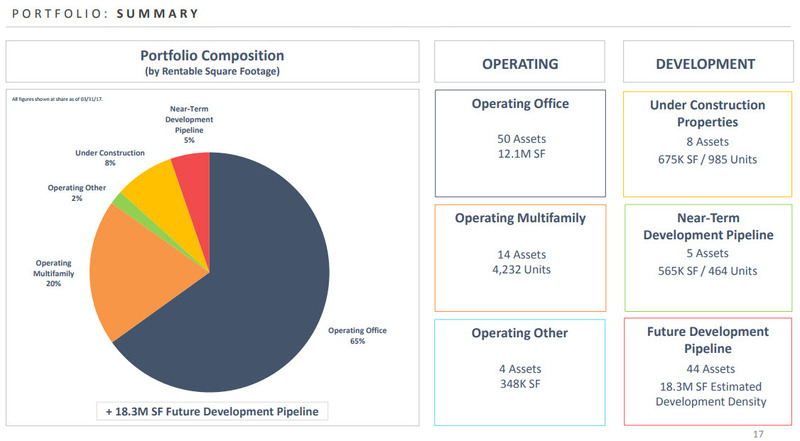 At the moment, the office space owned by the company accounts for about 70% of its assets and the residential buildings constitute the remaining 30%, but most of the properties under development in the near future are residential buildings so that the company’s portfolio will balance out in the coming years. This is important in order to reduce the company’s dependence on the office market, which could suffer if there is a slowdown in economic activity in the US in general, and in Washington in particular. Also, JBGS has a wide spread of income among the lessees, with the largest tenant constituting less than 3.4%, which reduces dependence on the departure of some tenant or other. What is the advantage of the company’s operation in several real estate fields? The company has extensive experience in the office, residential and commercial sectors, which gives it a significant advantage over real estate companies that are focused in only one of the three areas. For example, the company can purchase land in a particular neighborhood, then build offices, apartments and also a shopping center for the same people, enabling it to create a complete eco-system for the residents (work-live-shop) and easily populate the buildings it is building. 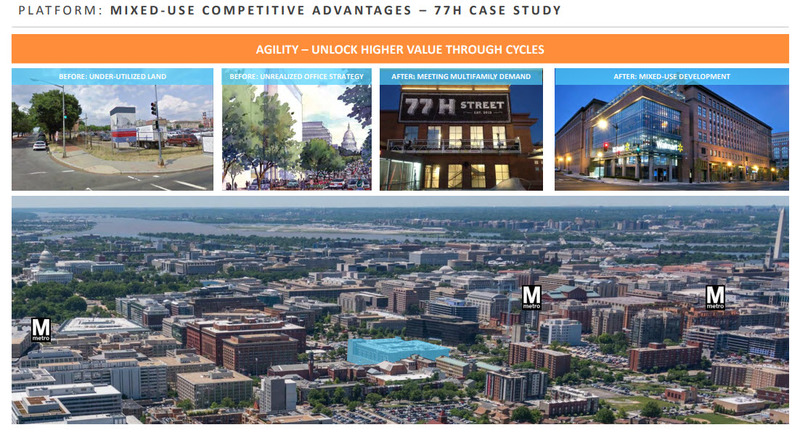 In addition, the company can maximize revenue by adapting assets to cyclical real estate markets. For example, if there is a weakness in the office space, it can convert an office building into a residential building, and vice versa. How does the company look financially? 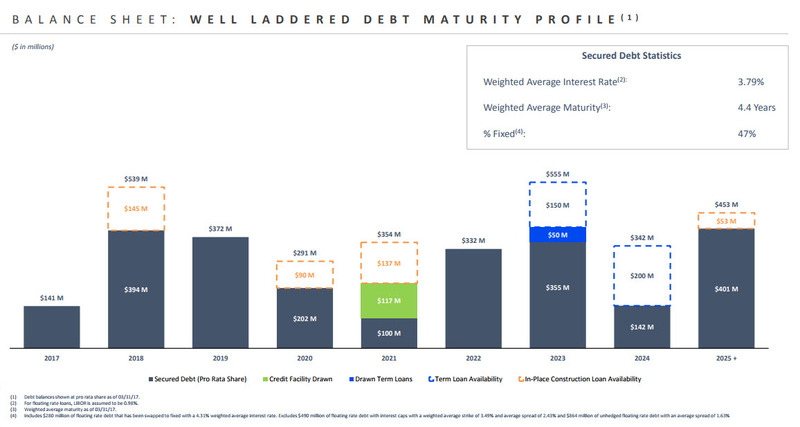 Like any typical real estate company, JBG Smith also bases its activity on debt, but its leverage is reasonable – Net Debt / Adj. EBITDA of 6.4 which is similar to the average in the segment and the company also has good liquidity: $528 million of cash, a credit facility of $1 billion, and the possibility of new loans of $400 million, which will enable it to finance future projects and support growth. 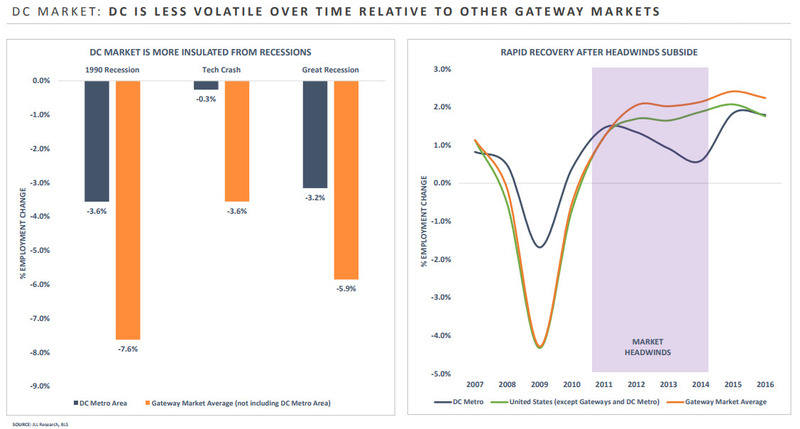 Another important point is that the debt maturities are spread more or less equally over ten years, thus limiting the credit risk even in the event of an economic slowdown that will hurt profits. As stated, the Company has 13 properties under development (8 office buildings and 5 residential buildings), which are expected to begin generating revenues in the coming years. In addition, the company intends to improve occupancy rates in residential buildings to 95% and in office buildings to 91.5% and to increase rental prices by several percentage points. The company predicts this will result in a 6% growth in NOI (Net Operating Income) in the next six years. In addition, the company has another 44 properties that are planned to be built in the more distant future (the land for 38 of them has already been purchased and another 6 are optional). Under the assumption of $275 per square foot (based on past data), the company predicts an additional $5 billion to the net asset value. It won’t happen tomorrow morning, but it gives the company good growth prospects for the coming decade. 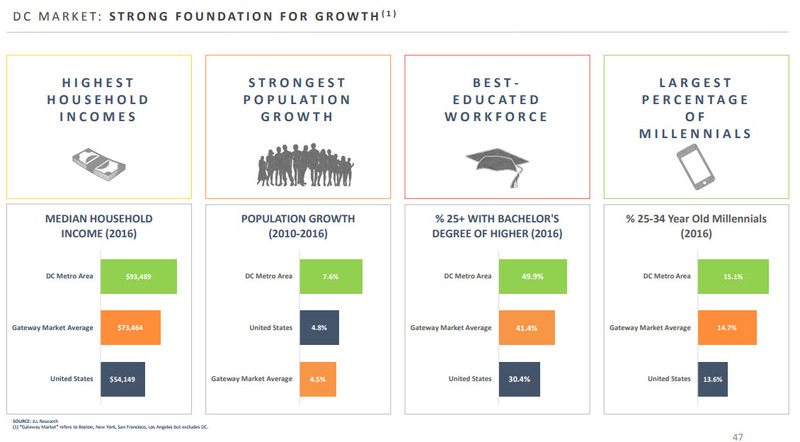 The demographic growth in Washington DC is among the highest in the United States, and most of the population is young and has an academic education, which can support the company’s growth plans. Vornado shareholders received about 73% of JBGS shares in the Spin Off, while the rest of the shares will be divided 21% to the previous shareholders of JBG Companies and 6% to the new company’s managers. This means that control is in the hands of the public, but the company’s managers will have significant holdings in its shares so that they will have a clear motivation to generate growth and improve activity that will raise the share price. The main question: How much is the stock worth? 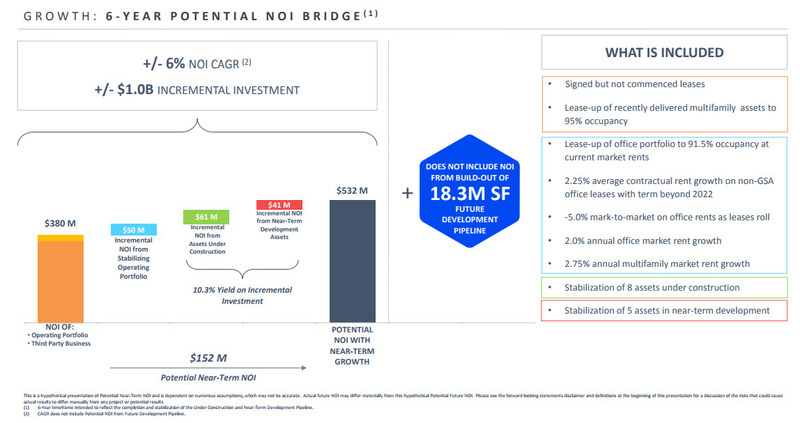 In the presentation for the Spin Off, the company presented a simple diagram that summarizes the net asset value of the current rental properties and the added value of the properties in the near and in the longer term (by the way, NAV means the cost of the asset, Net of the net debt taken to finance the acquisition of the property). The net asset value of JBG Smith’s current portfolio is $41.34 per share (assuming 137.8 million traded shares). An addition of $6.41 per share will be added to its expected value after the company stabilizes its asset portfolio operations. Another $3.05 is due in the near future after completion of the renovation of the properties under renovation, and an additional $2.10 will be added after completion of development of the properties under construction. In other words, in the next few years JBGS’s NAV will grow to $52.9 per share, which is 50% higher than the current price of the share, about $35. In the longer term, the company plans to continue to grow and build buildings that could add another $5 billion to its net worth, which is equivalent to $36.61 per share. This is consistent with the management’s forecast to double the company’s assets over the next 9-10 years. This is certainly an ambitious goal, but one that can be achieved if the real estate market in Washington continues to expand and the US economy will continue to recover. But before you rush to buy the stock, let’s remember that the value of the net assets is indeed an indication of the real value of the property, but not always. It may be that the property was bought (or in the case of JBGS, built) at an expensive price, and is now worth less. So how do you know how much the current fair value of the property is? 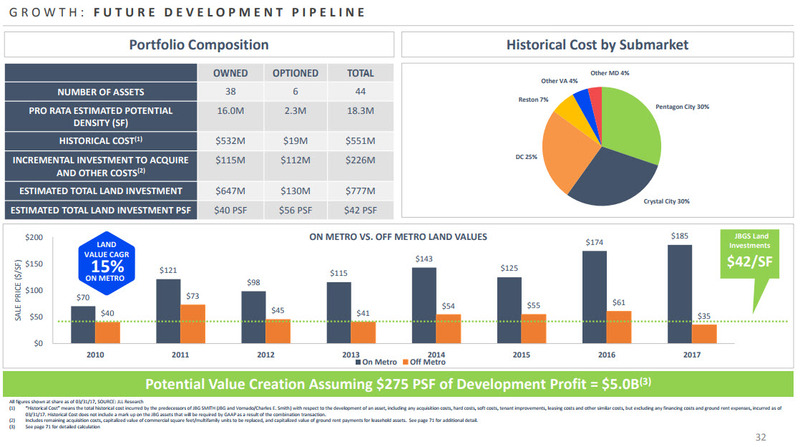 To get a better estimate of value, you need to understand what profits (or more accurately the cash flow) can be generated from the properties (this is exactly as an apartment buyer decides if it is attractive to buy based on the annual rental yield it is expected to generate less maintenance expenses). According to the JBGS consolidated pro forma report, it is expected to generate a net operating income (NOI, which represents the net profit from asset management only, i.e. 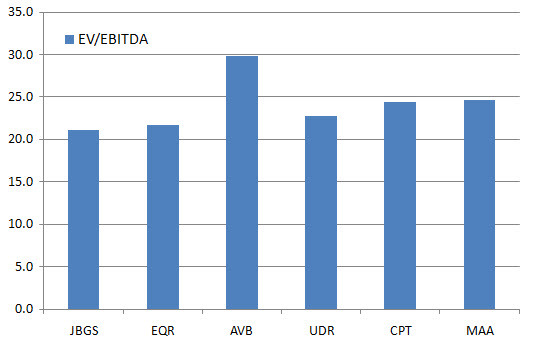 rental income minus operating expenses) of $341.9 million or adjusted EBITDA of $327.1 million. 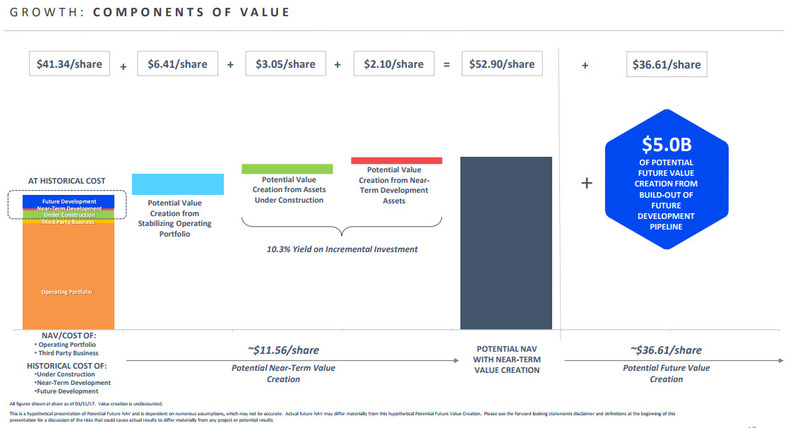 With a net debt of $2 billion and 137.8 million shares outstanding (fully diluted), the company trades at a NOI multiple of 14.1 and an EV/EBITDA multiplier of 21.1. These are quite high multiples, both in absolute terms and in relation to competitors in the office real estate sector. However, JBGS also operates in residential buildings, where growth, profitability and occupancy are higher, so companies operating there are traded at a higher pricing. 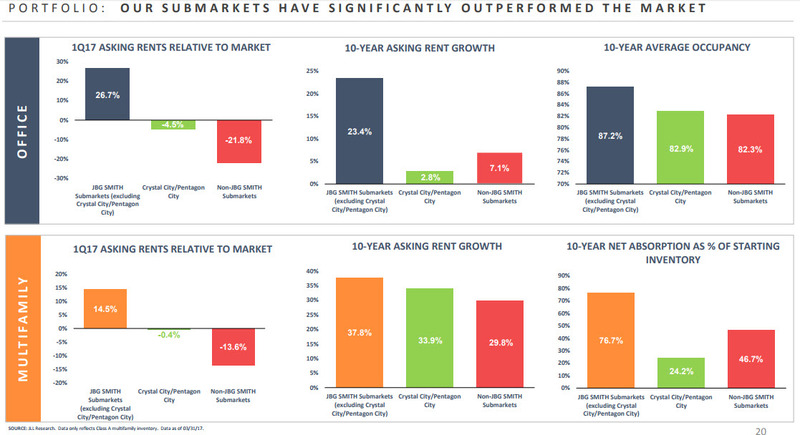 Currently, residential real estate activity is only about 30% in JBGS, but its share is expected to grow in the near future, so JBGS can be justified by slightly higher multiples compared to other companies that operate only in office space, but not higher than current multiples it’s currently traded. But, it is important to mention that JBGS trades relatively low compared to its equity (P/B of 1.2), with the average P/B ratio at 1.8. This implies that the company does not make the most of its assets or that it operates inefficiently (or simply raises its assets value too high…). It is possible that now, after the spin-off, it will become more efficient and improve its profitability. This is typical of spin-off companies. If this happens, it will give an added value, but it will not happen tomorrow morning; it will take time to be reflected in the financial results of the company. Is all rental real estate market expensive? It can be seen that US real estate companies in the fields of office and residential rental have not added much to their value in the last five years, even though leading US indices have flown up. One of the reasons for this is the low growth and relatively high pricing in which they are traded. Another indication of the high pricing is the low dividend yield of the companies’ in the industry – an average of only 2.5%. 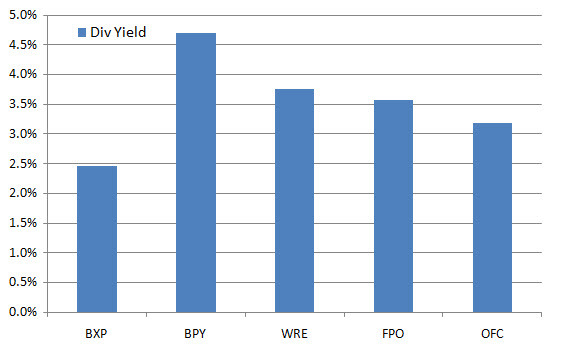 In my estimation, JBGS is not expected to yield higher dividend yields. The REIT annual FFO is expected to be about $170 million a year and the maintenance costs will be approximately $58 million, leaving the Company with funds available for distribution (FAD) of $114 million. Even if we assume that 90% of that will be distributed to investors (which is a high percentage), they will benefit from a dividend of $102 million, or $0.75 per share, equivalent to a dividend yield of 2.1%. 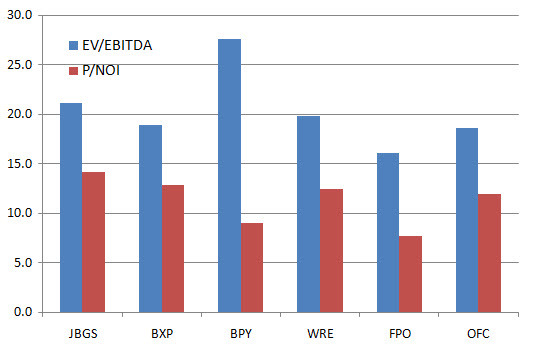 I may be too conservative about the expected FFO, and the actual dividend yield will be slightly higher, but not by much, so that does not really justify buying the share at the current price. The real estate market for offices in Washington is one of the most stable in the US, but stability has been shaken between 2007 and 2010, largely because of the massive construction of office buildings and cuts in the US administration. The crisis began after the severe financial crisis of 2008, after which many offices in the capital were shut down, mainly by huge law firms operating in the region, as well as a budget freeze and streamlining measures in the US administration and military bodies that reduced demand for offices. In the last two years prices and occupancy in the office sector have recovered, and now there is optimism about the real estate market in the capital after Trump’s election to the presidency, but the picture could change in the future. JBS Smith is heavily dependent on rental income from offices, so the slowdown in the sector can make it difficult for the company to meet its growth and profit targets its. The dream of any investor is to hold shares of a quality company with a rich asset portfolio like that of JBGS. 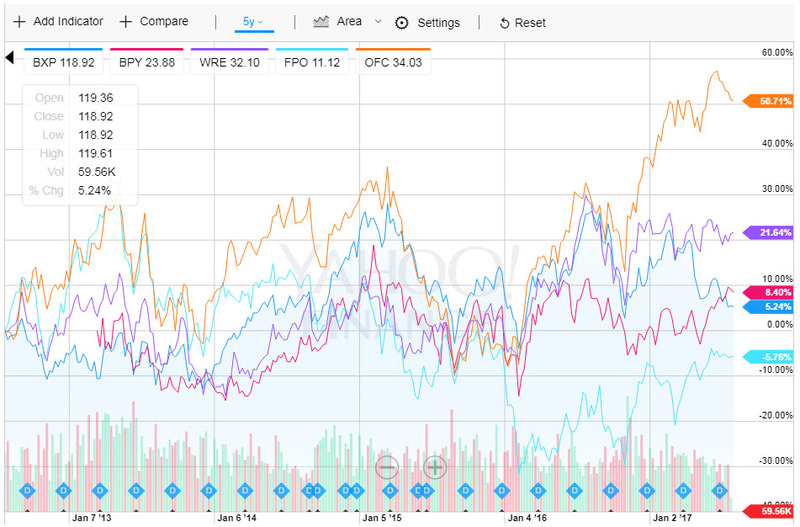 The problem is that the stock trades more or less in its fair price environment. The increase in operational properties in the next few years will add some value to the balance sheet, but will not increase the NOI in such a way that it will lower the share’s pricing back to the average pricing in the sector, not below that. Therefore, I think we should add JBGS to our watch list and hope that the typical spin-off selling pressure will lower the price to the $30 level, and then we can consider investing in the share. Be the first to comment on "JBG Smith Properties – Is this great Spin-off REIT an attractive buy?"